Finding cool educational toys for 3 year olds and up can sometimes be difficult. Many of the toys can quickly be outgrown or become boring to children. Fortunately, the clever clogs at Vtech Toys are always above the curve when it comes to creating amazing learning toys for kids that they’ll fall in love with and enjoy for a long time. 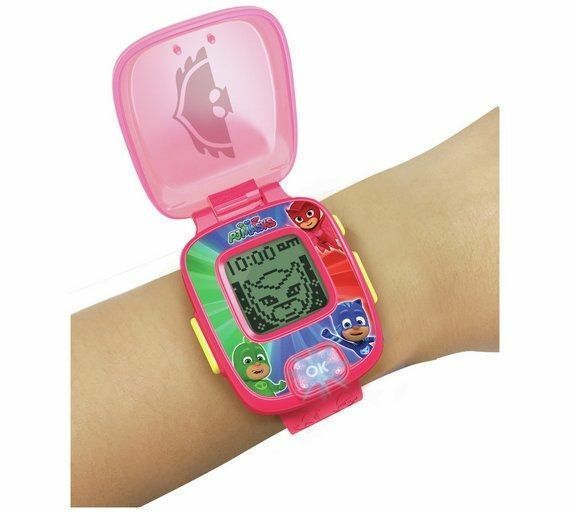 This time Vtech have outdone themselves with the new VTech PJ Mask Learning Watch series. Available in three colours – one for each PJ Mask superhero (Owlette, Gekko and Catboy – these sturdily-built, slick-looking multi-function power watches make for great sidekicks in any kids’ daily adventures. The stylish, simple and safe design of the Vtech PJ Mask Watch makes using it a doddle. With a comfortable adjustable wristband and a radial watch face formed from robust plastic, these watches are wearable accessories for most activities. Each watch has a protective cover with its distinct super hero emblem on it. Simply flick it open to gain access to the digital display and operational buttons. The right side of the watch has most of the buttons. Here users can control the clock/game functions with the clock/home button, the OK button that lights up and the right directional button. On the other side is where you’ll find the left directional button. Now you’ve got all the tools you’ll need to explore all the watches entertaining features in the most tactile and interactive way. Though the watch is quite compact, it doesn’t look or feel crowded with the buttons spaced out well. The centrepiece is a colourful design of the PJ Masks heroes in heroic poses. And, weighing in at just 386 grams, you may notice this awesome kids’ toy distinctive looks but you won’t feel it at all. Let’s face it: what you’re really interested in is the sweet games and functions these badboys have. Obviously it has a clock function that is fully adjustable. The settings allow the user to set time in 12-hour time format. There are also further settings that enable the user to change the clock face – which is basically the screen image on the watch – and even turn the watch into a cuckoo clock that chimes on the hour from 7am to 7pm. This is maybe not the best function when your little ones are trying to catch a sneaky midday nap, so it can be easily turned off too. 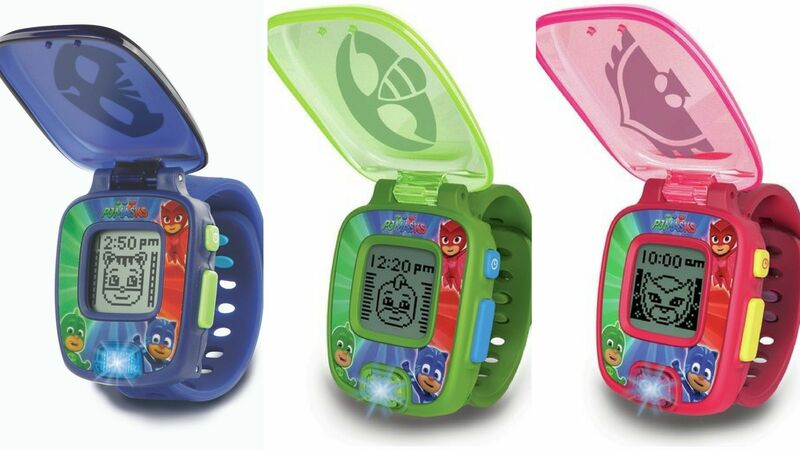 Like most digital watches, the VTech PJ Mask Watches have alarm clock, stopwatch and timer functions. Now kids can add an extra time challenge to their physical activities. These functions also provide an excellent introduction into understanding time and numbers. With clear illustrations and big numbering, keeping tabs on lap times is easy for all users. Finally comes the really fun part – the games. There are 4 entertaining and educational games for young learners to get into. The best way to teach young people is to make the lessons as attractive as possible. Vtech know this and add shapes and numeracy into each game. In Gekko-Mobile Pursuit, players use shapes as clues to help them track down the location of Romeo’s (the show’s notorious villain) mobile laboratory. Solve maths problems in Running Maths to find Luna Girl – ideal for toddlers aiming to perfect their addition skills. Flying Discs and Ninjalino Numbers are quite similar to Running Maths but they require focus to hit numbers on demand and count to the correct totals. After going through the games, kids will feel a lot more comfortable with basic maths in no time. Comfortable to wear and fun to use, the enjoyable Vtech PJ Masks Watch is the perfect educational toy for toddlers. It acts as an introduction into timekeeping and numeracy on the go. For lovers of the incredible Disney series, they’ll appreciate all the PJ Masks-related symbolism that each of the three watches boasts. More than anything else, though, this is just a smart action-packed timepiece that provides hours of fun.